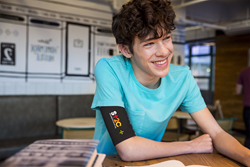 Stand Up To Cancer (SU2C) and innovative healthwear company Care+Wear announce the launch of the SU2C Care+Wear PICC Line Cover to better the treatment experience of patients receiving cancer therapies through a PICC Line (Peripherally Inserted Central Catheter). We are excited to work with a company at the vanguard of healthwear on providing an option for patients in the SU2C community. - Stand Up To Cancer President and Chief Executive Officer Sung Poblete, Ph.D., RN. Stand Up To Cancer (SU2C) and innovative healthwear company Care+Wear are proud to announce the launch of the SU2C Care+Wear PICC Line Cover to better the treatment experience of patients receiving cancer therapies through a PICC Line (Peripherally Inserted Central Catheter). The soft and stretchy Cover, which features the SU2C logo, is designed to eliminate some of the challenges of having a PICC Line by securely covering the PICC, while allowing for breathability and visibility of the PICC line site and dressing. PICC lines, usually planted in the arm, are semi-permanent IVs used to administer chemotherapy or other IV treatments to patients at home or in the hospital. Traditionally, hospitals provide patients with a gauze sock to protect their PICC lines when they leave the hospital. The SU2C Care+Wear PICC Line Cover allows for easy monitoring of the PICC site for dislodgement, leakage or infection by clinicians, patients and caregivers through the patent-pending mesh window, while simultaneously providing airflow to the site for proper dressing functionality. The Cover is also coated in antimicrobial treatment and is machine-washable to ease the burden on patients and caregivers during treatment. The SU2C Care+Wear PICC Line Cover is available for purchase online on Care+Wear’s website. From now until August 31, 2019, 10% of the purchase price for all SU2C Care+Wear PICC Line Cover sales will go to supporting Stand Up To Cancer’s awareness programs, cancer research efforts and cancer prevention education to help more people diagnosed with cancer become long-term survivors. For more information about the collaboration, visit https://www.careandwear.com/pages/su2c. Stand Up To Cancer (SU2C) raises funds to accelerate the pace of research to get new therapies to patients quickly and save lives now. SU2C, a division of the Entertainment Industry Foundation (EIF), a 501(c)(3) charitable organization, was established in 2008 by film and media leaders who utilize the industry’s resources to engage the public in supporting a new, collaborative model of cancer research, and to increase awareness about cancer prevention as well as progress being made in the fight against the disease. As SU2C’s scientific partner, the American Association for Cancer Research (AACR) and a Scientific Advisory Committee led by Nobel Laureate Phillip A. Sharp, PhD, conduct rigorous, competitive review processes to identify the best research proposals to recommend for funding, oversee grants administration, and provide expert review of research progress. Current members of the SU2C Council of Founders and Advisors (CFA) include Katie Couric, Sherry Lansing, Lisa Paulsen, Rusty Robertson, Sue Schwartz, Pamela Oas Williams, Ellen Ziffren, and Kathleen Lobb. The late Laura Ziskin and the late Noreen Fraser are also co-founders. Sung Poblete, PhD, RN, has served as SU2C’s president and CEO since 2011. For more information on Stand Up To Cancer, visit StandUpToCancer.org. Founded in 2014, Care+Wear is a leading provider of innovative healthwear focused on creating positive and effective healing experiences for patients everywhere. In collaboration with patients, clinicians and hospitals, Care+Wear’s primary products address the comfort of patients who have PICC lines or chest ports by providing wearable solutions that are both functional and fashionable. Dedicated to giving back, Care+Wear gives a portion of its sales to non-profit foundations such as Stand Up To Cancer, the American Cancer Society, Global Lyme Alliance and RockCF, among other partners, to help patients and families before, during and after medical treatment. Care+Wear works with leagues such as Major League Baseball and the National Basketball Association so that patients can support their favorite teams while undergoing treatment. For more information, visit http://www.careandwear.com.